Emotions can run high on Dr. Phil’s show, so it isn’t always easy for him to find a break from the drama during which he can grab a snack. Here are six memorable times when Dr. Phil totally got called out by a guest for trying to discreetly eat sunflower seeds while they were crying. 1. The time Dr. Phil taped a bag of sunflower seeds onto his guest’s shoulder and ate from it every time he hugged her while she confronted the man who killed her son in a drunk driving accident: Dr. Phil thought he was being totally inconspicuous when he asked the wardrobe department to tape a bag of sunflower seeds onto his guest, a woman whose infant son had been killed in a drunk driving accident. But the woman was in the middle of confronting her son’s killer over speakerphone when she noticed Dr. Phil resting his head on her shoulder for an extended period of time. Through wracking sobs, she managed to ask the TV host why he was grabbing sunflower seeds out of the bag with his tongue and chewing them without even shelling them first. 2. When Dr. Phil hired a sniper to hide in the rafters of his studio and shoot a sunflower seed into his mouth every time he opened it to say something: The iconic episode of Dr. Phil during which a woman met her husband’s mistress on air turned into a totally awkward moment when both crying women called Dr. Phil out for the fact that every time he opened his mouth to say “Wow,” a sniper perched in the rafters of the studio used an airsoft gun to shoot a single sunflower seed into his mouth. 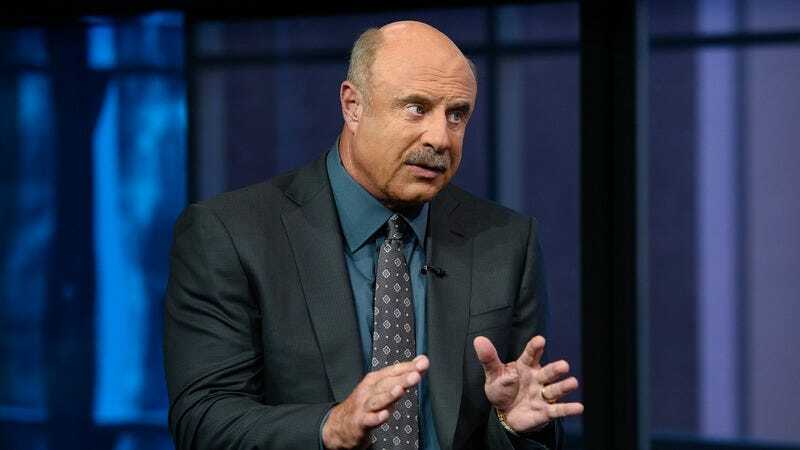 The plan might have gone off without a hitch, but unfortunately, the women were tipped off when Dr. Phil got too hungry for seeds and kept saying “Wow” over and over while they tried to offer their perspectives and experiences. 3. The time Dr. Phil drew his own face on a feed bag full of sunflower seeds that he wore over his head while he spoke to the parents of a school shooter: When Dr. Phil invited the parents of a boy who had shot and killed three students at his high school onto his show, he tried to conduct his entire interview with them through a canvas bag full of sunflower seeds with a crude picture of his face drawn on the front of it. The attempt went south when Dr. Phil’s guests noticed sunflower-seed shells falling out of the bottom of the bag while they were describing seeing their son for the first time after the shooting. After initially trying to play it off, Dr. Phil eventually took the bag off to reveal that it was full of wet, half-eaten sunflower seeds, and the already emotional couple was furious. 4. When Dr. Phil told a guest he was sick and needed to take “200 pills,” and then proceeded to eat sunflower seeds out of a bottle of ibuprofen for the rest of the interview: Dr. Phil was interviewing a teen runaway who had just been kicked out of a homeless shelter when he abruptly asked his guest, “I’m sick—would you mind if I took 200 pills I need?” Caught off guard, she agreed, but got upset after Dr. Phil spent the next several minutes pouring sunflower seeds into his mouth from a jumbo-size bottle of ibuprofen while she broke down describing the difficulties of trying to get her first job while living alone on the streets. 5. The time Dr. Phil hid behind his couch to eat sunflower seeds while an Iraq War veteran told him about his struggle with PTSD: During a Veteran’s Day episode focusing on soldiers’ post-war struggles, Dr. Phil was speaking to a veteran with PTSD for several minutes before the man dissolved into tears and Dr. Phil—yelling “My couch feels broken, and I need to hammer a nail into it, please keep talking!”—dropped to the ground and crawled behind his couch where he began to eat sunflower seeds. Unfortunately, Dr. Phil missed his guest’s entire story about a disturbing PTSD flashback that caused his wife to leave home with their kids, and the man laid into him for his total disrespect. 6. The time Dr. Phil paid an actress to pose as his wife and transfer sunflower seeds to his mouth every time he kissed her during an interview: Dr. Phil intended to have a meaningful conversation when he invited a woman who had become paralyzed from the waist down in a drive-by shooting onto his show, but the effect was not exactly uplifting, as Dr. Phil had hired a Los Angeles actress to pose as his wife and transfer sunflower seeds from her mouth to his by kissing him periodically during the segment. His guest’s story of the night of her attack was incredibly emotional, but she barely got to finish telling it before Dr. Phil said, “That’s so sad—and the only thing that will make me feel better is if I kiss my wife.” He then gave the silent actress a several-second kiss before gulping down a mouthful of seeds, and his guest immediately called him out for the gaffe.